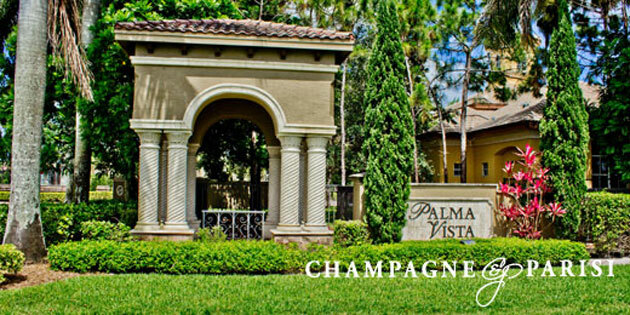 Palma Vista is a luxury guard-gated community located just south of Glades Road on 441 in West Boca Raton. This premier community immediately greets you with cascading waterfalls, stately trees, and tropical foliage so definitive of the South Florida lifestyle. In general, Palma Vista is known not only as a desirable destination, but also as one of the most prestigious "new home" communities in the entire area. Accordingly, homes in Palma Vista price from the mid $400's to just under $1 million. Residents of Palma Vista enjoy many premier amenities, starting with the 5,000 square foot clubhouse. This gorgeous facility is complete with private rooms for hosting events or meetings, a fully-equipped fitness center, aerobics studio, and, of course, a resort-style swimming pool with a relaxing waterfall. Briefly put, Palma Vista is a truly wonderful development, allowing you to get everything you could ever desire in South Florida living.